John Petrak lived and worked on the Motor Yacht "Outrageous Conduct" and was an international award winning photographer. He studied photography in 1978 and casually pursued nature and landscape photography until he began scuba diving in 1992. The combination of a fascination for the underwater world and his long term hobby provided the catalyst to create a serious passion for photography with a special emphasis on underwater imaging. 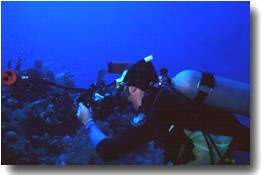 John traveled frequently in pursuit of new locations to dive as well as capture specific photograph images and has traveled extensively throughout the US, Caribbean and Mexico. 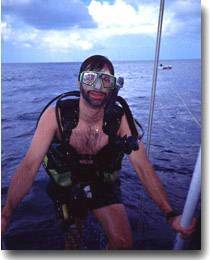 He was a frequent diver on the West Coast from Cabo San Lucas, Mexico to Victoria, BC. The Monterey Bay and Carmel areas hold special interest for John due to his proximity to this world-class cold water diving destination. He was intimately familiar with the region and has been exploring it regularly using Ocean Kayaks as his preferred method of scuba diving. His photographic equipment of choice is a Nikon N90s in an Ikelite housing with an assortment of Nikon lenses and Ikelite strobes and favors Fujichrome films. Occasionally Nikonos and Sea & Sea camera systems are used. John's work is offered for sale and publication via this web site and other means of distribution. "I love the sea and all things about it. I travel to experience the reefs, the ocean life, the boats, islands, countries and port towns. I've built the Ocean Photos web site to share these things through my photography. Please enjoy these wonders on Ocean Photos and go out and experience them first hand!"